Susan Henderson is a four-time Pushcart Prize nominee and the recipient of an Academy of American Poets Prize. She is the author of two novels, The Flicker of Old Dreams and Up from the Blue, both published by HarperCollins. Susan lives in Kings Park, New York and blogs at the writer support group, LitPark.com. 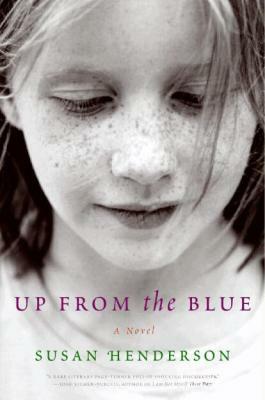 Up From the Blue features a frame story (a story within a story). How do the chapters about grown Tillie enrich the story of 8-year-old Tillie? How would the novel be different if the author had only written about young Tillie? Eight-year-old Tillie is introduced as a biter who liked to leave a mark. What was your initial impression of her? What do you think she craved? Describe the difference between how Phil and Tillie experienced the same events. Which character was more sympathetic to you? And does it surprise you that the same events could impact siblings so differently? Do you think it's realistic that no one knew what was happening inside the Harris family's home? Why do you suppose Phil and Tillie didn't tell a neighbor or a teacher? Throughout the novel, Tillie made references to the neighbors who seemed to live such peaceful lives, but through her contact with the other children, she became aware of divorce, bullying, and racism. In what way is it helpful to see Tillie's situation in the context of the larger community? What did you learn about Tillie by the people she's drawn to and how close she allows herself to get to them? When Tillie discovered her mother in the secret room, did you believe what was happening? Why do you think Mara was so alive in the secret room but hardly functioning when she lived with the rest of the family? Were you surprised to learn why Mara disappeared? And were you frustrated with the characters for their actions or inactions? What was the significance of the ruby cup to Tillie, and how did that change near the end of the book? Mara talked about the woman in the golden gown to communicate her dreams and her regrets. Where is the line between self-fulfillment and sacrifice for others? Eight-year-old Tillie's story ended with the family walk. Did this gain significance when you read the final chapter of the book? How did you find the final scene between grown Tillie and her father? What was your reaction to Tillie's statement, "I want him to be as powerful a father as he is a scientist"? By the end of the story, Tillie seemed more open to reconnecting with her father, while Phil had gone his own way. What would you have done? In the closing chapter, Tillie wonders what her mother might have become if they'd offered her help? Do you think she could have been helped? What kind of mother do you think Tillie will be? What makes you feel hopeful or pessimistic about her future? Do you think children from unstable upbringings struggle about starting families of their own?